Long Point High School "Tigers"
Long Point (population 247) is located in north central Illinois toward the east side of the state. The town is located in northwest Livingston County about 8 miles south and a little west of Streator. The main roads in and out of Long Point are County Road 31 going east and west and County Road N 200 E which travels north and south. Illinois Route 23 is located about 2 miles east of Long Point as well. The Long Point Creek flows to the south and east of town. As with most small towns without a main highway traveling through it, Long Point was established on the railroad line of the At & St Railroad Company. The area around Long Point began offering general education for its children in a log cabin located in Long Point Township in 1843, and the earliest classes were held in the village was 1857. Nearby Reading Township had a school as early as 1832 when the Daniel Barickman family bought 240 acres of land along the Vermillion River and set up a school on it, making this part of Livingston County the earliest-known to have offered education, according to a 1979 book written by former county superintendent Lucille Goodrich entitled "A Livingston County Scrapbook: 1855-1975." High school courses were offered on a two-year only basis through the early 1920's until state law made it easier to organize a community high school in Long Point. 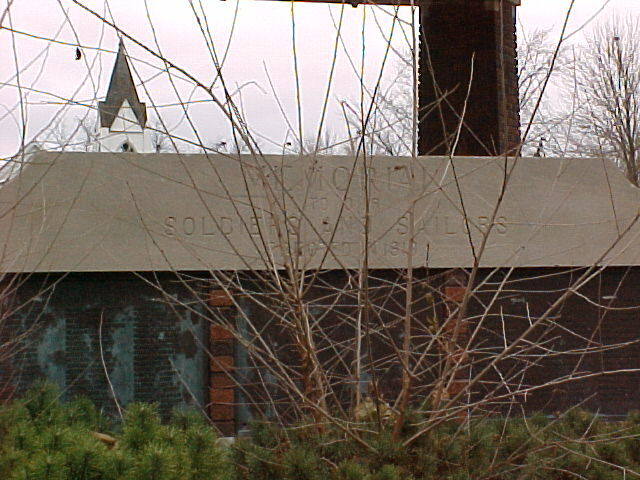 From the spring of 1923 thru February 1924, the new school building was erected. The first four-year high school graduating class of Long Point High was the class of 1923, made up to two graduates, Anna Ensign and Amee Moreland. Up until this point, LPHS students had their choice of continuing their education and earning their diplomas from either Dana, Pontiac, or Streator High Schools. In 1952, the folks of Long Point and Reading Township (South Streator) agreed to consolidate and form a new school district. The new District was called Streator Woodland. Students attended Long Point High School until the new Woodland School District building was completed in 1954. The high school students became officially part of the Woodland School District in 1954, closing the book on Long Point High School. Most of the residents in the Long Point District went to Woodland; however, some chose to attend nearby Minonk-Dana instead. 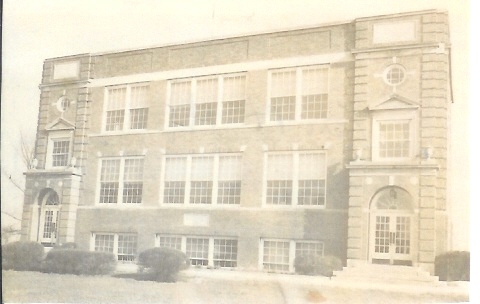 The Long Point High School building operated as an elementary school for some time after its closure, at least through 1971. 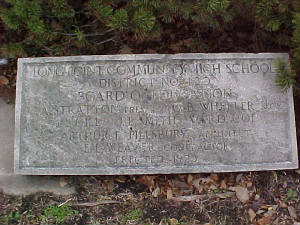 It was closed as a school, but was sold to the village in May 1973 and used as the home of the Long Point Community Center for several years, and demolished in about 1980. 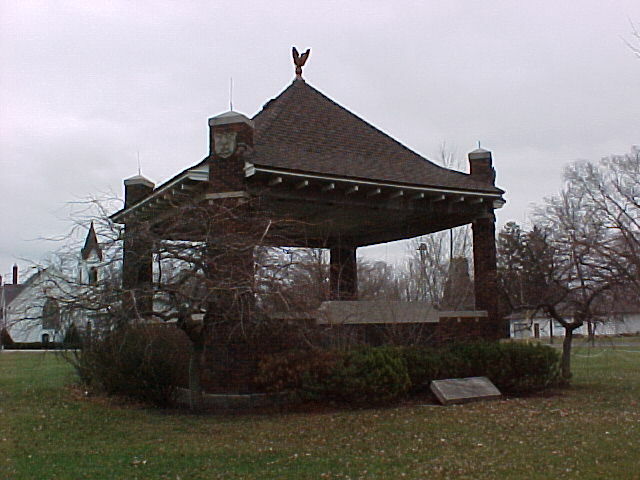 A cornerstone from this building is found in the town square, in front of the bandstand, which is a veterans memorial (see photos on this page). School Fight Song: "Hail to the Long Point Team"
The Long Point High School Tigers' athletic program definitely included boys' basketball. It is believed baseball and track & field were also offered at the schools. Conference affiliation and other sports offered are not known. The Long Point High School Tigers' boys basketball program ruled the little schools of the area for one six-year period in the late 1940s and early 1950s. The boys won five District Titles between the 1947 and 1952 seasons including four in a row from '49-'52. Add to this the District title won in 1933 and LPHS won a total of six District Titles during her existence. Unfortunately the team records and coaches names of these and potentially other great Long Point teams are not known. The years of the IHSA championships are listed below. "In 1952 at the Varna District Tournament, Long Point High School captured the title with a 60-56 victory over Toluca High School. *Darrell Garretson (Alumnus - unknown year of graduation) - If you watched the N.B.A. during the late 1970's, 80's, and especially the 90's, this name will jump put at you. Darrell Garretson served as a National Basketball Association referee from 1970 to 1997. Darrell was so well thought of that he was, in fact, the "Head of the NBA Officials" from 1981 to 1997. Not bad for a kid from Long Point, Illinois. Clive Reynolds -- served as principal of the school from about 1932 - 1948. "Recently, my son pointed out the Long Point High School website to me and I enjoyed reading about the history of the school. My father was the principal, Clive Reynolds, who served at the school for many years. I am not sure when he started working there but I suspect it was about 1932 and he left about 1948. I have vivid memories of the school and I think I can place the location of the different rooms. It is sad to think the building has been gone for so many years. It certainly looks sturdy in the picture. I am especially grateful for the words to the school fight song. I remembered most of it and have often impressed my family by serenading them with parts of it. They kindly indulge me."